Family camping is one of the great summer traditions in Ontario. If camping is not already part of your family’s summer schedule, perhaps this is the year to try it for the first time. Ontario has over 100 provincial parks across the province that offer car camping. What do we mean by car camping? Car camping allows you to drive right up to campsite which is located in a group of other campsites. Most parks are open from late spring (May or June) until autumn (Labour Day or Thanksgiving weekend). Check individual park listings for operating dates. 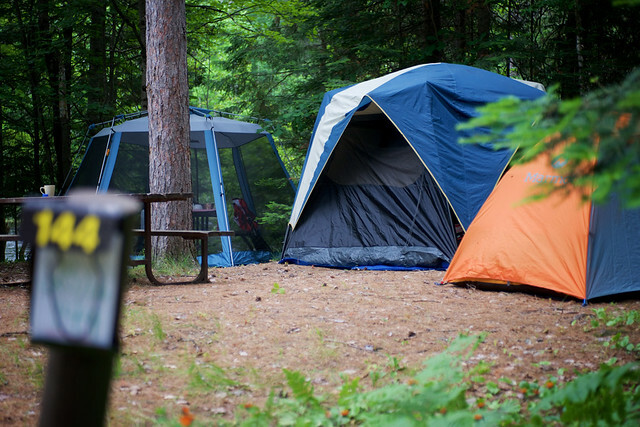 For those who want to try their hand at cooler weather camping, a few parks such as Algonquin, MacGregor Point, Pinery, and Killarney offer camping year-round. The first thing you need to do before coming to Ontario Parks is to decide just what park you would like to visit. The park locator can help make your selection easier. Would you like a park with a great beach, do you want a park that’s close to home, or do you want to dip a line into a local waterway. Use the park locator to select a park based on its distance from home or by the activities and facilities that you want during your visit. Seasoned park visitors should use the locator to find new parks that have all of the things that they love about their favourite park. You might also want to check out our annual Parks Guide. A PDF version is available online or you can pick one up at your local Ontario Park or tourism information centre. Reservations are NOT always necessary at Ontario Parks; even during busy summer weekends. You can reserve a campsite at most parks five months in advance of your date of arrival. Reservations can be made online or by contacting our call centre at 1-888-ONT-PARK. Some of our most popular parks such as Killbear, Sandbanks and Pinery do fill up quickly but many other parks will have sites available. When you first arrive at a park you will have to check in. Depending on the park you are visiting, you may have to park your vehicle and walk a short distance to register or you might drive up to the registration window. Check for signs as you enter the park. The gate attendant will prepare your park permit. The pink copy of the permit is displayed on the dashboard of your car. As well as allowing you to camp, this permit also provides you with day-use entry to any other Ontario Park for the dates displayed. You need to place the white copy on the permit post at your campsite. The gate attendant will also hand you a park map and provide directions for finding your campsite. After hours or during the quieter seasons there may not be an attendant at the gate. Instructions will be posted on how to register for your campsite. On the back of your permit you will find room for comments. Please fill this in and deposit it in the comment box as you exit the park. We read all of your comments and they are important to help maintaining the quality of the park. Your campsite comes equipped with a picnic table and a fire pit with grate. There will also be a level area to set up your camping equipment. The size of the campsite, the proximity to neighbours and the amount of sun and shade varies from park to park. The Ontario Parks reservation system includes detailed descriptions of all reservable campsites and pictures for most, so you’ll know what to expect. Water taps are found at regular locations throughout each campground. Unless a sign is posted saying otherwise, all water is suitable for drinking and is tested on a regular basis and overseen by the local Health Unit. If you are staying at a campsite with electrical service, a 15/30 amp electrical pedestal will be located near your campsite. Often pedestals are shared between two campsites. You should plan on bringing a long extension cord with you to reach the pedestal. Washroom facilities, either at comfort stations or vault privies will be a short walk from your campsite. A garbage disposal station(s) is available at every park. Please do your part to keep Ontario Parks clean. Recycling facilities are available at many parks however this may depend on the services of the local municipality. Many parks also have trailer dumping stations. Most parks have firewood and ice available for sale. If not, these items will usually be available close to the park. A few parks have full park stores offering groceries, other camping supplies, fast food and that summer treat…ice cream. Many parks offer equipment rentals such as canoes, bicycles, and paddle boats. Free to borrow with a deposit, many parks also have fishing gear and personal flotation devices to offer visitors. Some parks offer pet exercise and swimming areas. Check individual parks listings to see what other amenities are available at the park that you are visiting. Are you a first time camper? This camping checklist will help you pack. Avoid animal encounters by ensuring that you pack your food, cooler, and any kitchen gear that might have food smells into your car at the end of each day. Be a courteous camper; know the park rules, be respectful of other campers and leave your campsite the way you would like to find it. Plan for all occasions. Unfortunately the weather doesn’t always cooperate at Ontario Parks. Make sure you have suitable clothing for warm, cool and wet weather. Pack cards and games for rainy days. Leave what you find. Ontario Parks are special places that we are protecting for future generations. Leave rocks, plants and other objects as you find them. Do not collect firewood from around your campsite. Ask if you’re not sure. Park staff are happy to answer your questions and provide whatever assistance they can.